What will our future cities look like? Terms like smart city or resilient city or eco-city seem to be sometimes used interchangeably. What they really mean is how they help us deal with emerging problems. If you search for images of future cities you will find a range of utopian and dystopian sci-fi fantasies. One academic, Daffara, took these metaphors and created city classifications that we can use to examine the solution potential of these ideas. Indeed we can see these ideas reflected in the masterplan solutions presented for new and retrofitted cities. In this article we compare future cities concepts and compare them with their capacity to solve emerging problems. The problems we identified are: population growth, shortages in consumables including oil, fresh water and food, climate change induced extreme weather events, and the collapse in natural resources. Let’s examine some of the popular types of sustainable cities and what each of those labels implies, and whether they can address those emerging problems. We will do this by looking at examples for smart cities, compact cities, resilient cities, self-reliant cities and eco-cities. Smart networked cities: Virtual reality meets the real world. Smart cities are embedded with sensors to monitor real-time usage and provide peak-load dampening, to things such as water, energy, air pollution and traffic. They can also be used for a variety of citizen engagement projects and can be harnessed to provide early warning services and response for climatic events. While smart cities are able to manage resources more efficiently, they are not intrinsically about including more natural resources into the city. Demand smoothing also might make smart cities less rather than more resilient, and increased complexity has led some to be concerned about the consequences of malfunction or the difficulty of incorporating innovative technology in the future. Smart cities may be too complex to expand to include growing populations. Songdo is a new city south of Seoul with a sustainability plan, albeit with a lower urban density than Seoul, approaching a density similar to Singapore . Embedded sensors that monitor and regulate temperature, energy consumption and traffic. Smart water system to stop drinking water being used in showers and toilets, all the embankments water goes through a sophisticated recycling system. Future City Example: Smart cities are a popular term at the moment and India has announced that it will build 100 new smart cities. 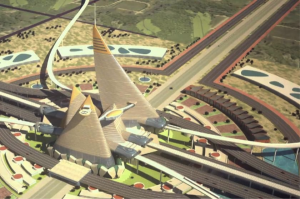 This picture is for the new smart city planned for Dholera SIR in India. Compact cities: Intensive and efficient urban living, optimizing and reducing demand. Compact cities are the opposite of urban sprawl and are intended to deal with the twin problems of increasing population and shortages of supply. Making it easier for people to satisfy their needs locally, within walking distance, and making it energy efficient to travel around the city by public transport reduces per capita consumption and higher density houses more people. Compact cities are not intrinsically designed to maximise natural habitat nor anticipate the demands of climate change. If all these three things are held constant then there should be a maximum optimum density, however high rise cities are actually very successful. 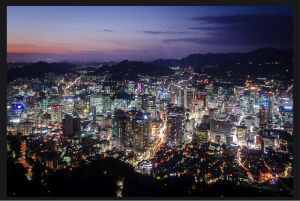 Seoul in South Korea is a case in point, with one of the world’s highest urban densities, low GHG emissions per capita, and coming 7th on the ARCADIS Sustainable Cities Index and ranking highly for people, planet and profit. 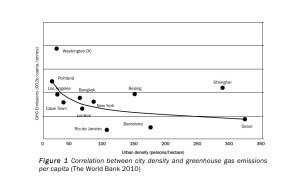 Seoul has one of the highest urban densities in the world & relatively low GHG emissions. Future City Example: Compact cities are also a popular term for urban master plans. The compact urban form masterplan for the new Egyptian capital city, uses medium and high-density neighborhoods centered on a community public space surrounded by local shops, schools, religious buildings, and civic amenities. Resilient cities: Future proofed city, robust to the emergent risks of climate change, flexible and responsive land-use, infrastructure and buildings. While some resilient designs describe maximizing efficiency with smart-city solutions, actually a system with no redundant components has no resilience. These cities will be typified by a belt-and-braces approach. Resilient cities are typically thought of as those protected from extreme weather, however provision for shortages in food, energy and water supply also increase resilience. In a holistic sense, urban resilience is the capacity of individuals, community, institutions and systems within a city to survive, adapt and grow, no matter chronic stresses or acute shocks they experience. This includes earthquakes and floods, but also unemployment and economic stresses. I have written more about creating resilience against these effects here. 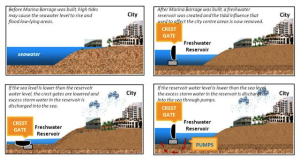 Example: Singapore’s Marina Barrage not only protects urban areas from tidal surges but also creates a freshwater reserve for city water supply. Future City Example: Already designed and funded, the New York Big U or as it’s colloquially named, the Dryline will be a 16km (10 mile) flood protection system to protect lower Manhattan from events like the 2012 Hurricane Sandy. The 3 to 6 meter high berm will be a semi-permeable barrier of trees, landscaping, and bridges with movable integrated floodwall components. 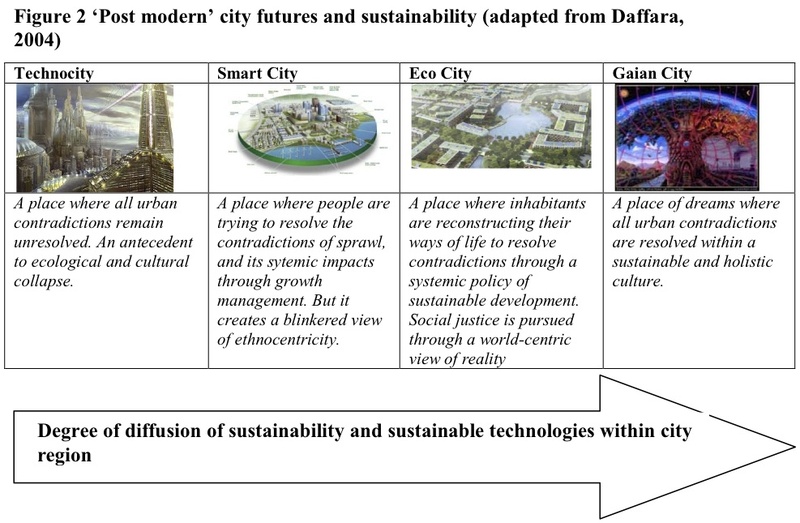 Self-Reliant cities: Self-replenishing, circular metabolism (cradle to cradle). Although there are no examples of completely self-reliant cities, several are tackling self-reliance for water or energy. These types of cities may be quite sensitive to fluctuations in population size. In Scandinavia there are several cities with high sustainability standards, making them good examples of renewable energy, amongst other sustainable infrastructures. 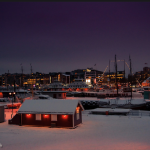 While Copenhagen, Amsterdam and Rotterdam all reached the ARCADIS Sustainable City Index 2015, it is Oslo that powers 80% of the city heating system with mainly biomass from residual waste. Sure, other cities like Reykjavik uses only 0.1 % fossil fuels providing power for the city, but the waste use in Oslo is a good example of circular metabolism. 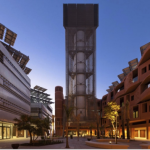 Future City Example: Masdar City, Abu Dhabi, is still only partially complete. In 2006 the Emirati government imagined Masdar as the world’s largest zero-carbon settlement, 5.95km2 in size. It was planned as a self-reliant city, producing it’s own energy, zero-waste and car-free, with vegetables grown on its fringes. After the financial crisis plans changed from self-reliant to low carbon city, with it’s own solar plant, driverless electric vehicles and passive design features, and completion set back to 2025. Eco-cities: Urban agriculture and harnessing ecosystem services for energy, shelter, water, waste and extreme weather control. Actual eco-cities are hard to find, yet they are captivating to imagine. Eco-cities use eco-system services to provide for the needs of the inhabitants and have a positive impact on their surrounding eco-system. 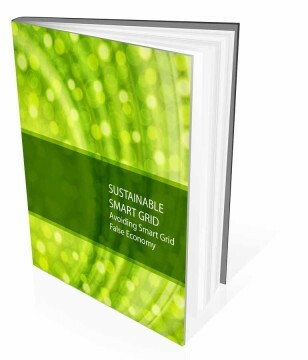 The concept is simultaneously compact and verdant, and adaptive to environmental shocks. Not necessarily self-sufficient, these cities are producers of resources that can be traded between networks of other cities. Examining the sustainability initiatives of planned, new and retrofitted cities reveals that eco-cities are often considered to be cities with more open space. In high-density cities around the world the aspirational classes imagine living amongst parks and gardens. 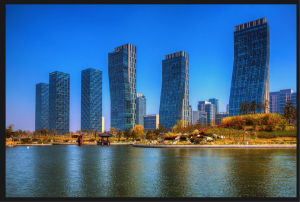 This is why Seoul’s neighbouring city, Songdo, has been planned with lower density and 40% open space. 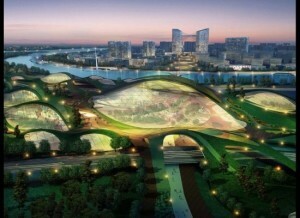 Tianjin, another planned eco-city, has abundant green spaces integrated into the urban fabric, even though the World Bank thinks the eco-targets for Tianjin are far from extraordinary compared with some European countries. Future eco-cities that incorporate vegetation into the urban fabric will probably use a mixture of new building materials and building methods (like 3D printing) to provide green roofs and sky gardens, probably also using algae technology to produce biomass and Oxygen, and hopefully also increase urban agricultural production. All of these technologies already exist although finding them at city scale is a challenge. Future City Example: This design is one to stretch your imagination. 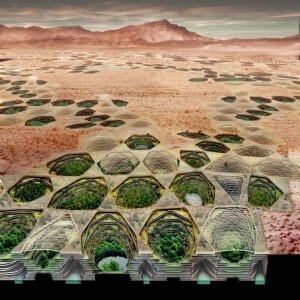 This design for an underground city in the Nevada Desert captures and stores it’s own water, cultivates vegetation in a harsh environment, and protects inhabitants from intruders. Many cities use catch phrases to describe their initiatives but the goal posts are movable. In China the term eco-city conveys a higher quality, lower density, urban area for aspirational classes. In Europe eco-city means more than protecting the environment, it means utilizing ecosystem services in a symbiotic relationship for people and nature. It is clear that, while the catch phrases for cities such as smart-city and green-city are sometimes used as synonyms, it does make a difference which term is used. We have seen that real city examples are approaching multiple solutions simultaneously, like Songdo, incorporating green space with smart technology. Above and beyond which term is used, it is also true that cities need benchmarks. Often we are seeing terms used to indicate high-sustainability that aren’t global best practice. Because openly available consistent data and rankings are lacking it is almost impossible to say which is the greenest or most sustainable city in the world. Only with proper comparisons between best practices is it possible to understand what are simply popular catch phrases used without substance and what are really sustainable rational investments into city development.